This invoice from Shelby American to Zurich American Insurance, for the convertible that was "Stolen and Returned, April 1967," is, to say the least ... suspicious. Carroll Shelby, in his 2003 interview regarding #0139, stated that this convertible wasn't actually "stolen." 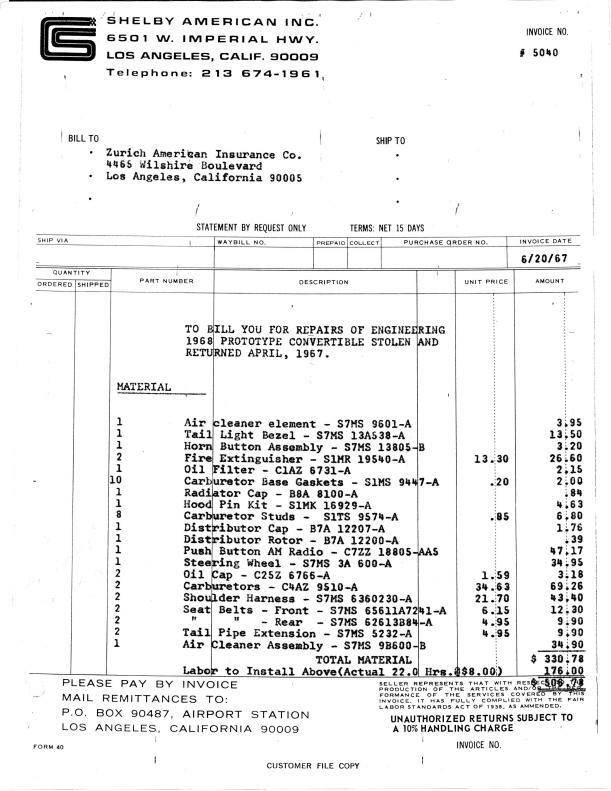 When analyzing this invoice, we quickly see that the parts itemized look a lot like a 'shopping list' of the bolt-on parts that would be required to aesthetically update/modify a '67 to make it look like a '68. You'll notice that no fiberglass components are itemized, and that's because those components were fabricated and provided by A.O. Smith Plastics based on Ford's updated design. According to the Van Akin letter, A.O. Smith supplied two sets of the front-ends, hoods, rear valences and center consoles for the purpose of modifying two cars, a fastback and a convertible (#0139), for "photographic purposes." In March 1967, a month before the alleged theft, Shelby American placed the orders with Ford that would be fulfilled. It appears that the April/Mat 1967 timeframe was when Ford made the decision to terminate the California-based Shelby Program and acquire the assets/liabilities of Shelby American, Inc. When you populate a timeline of the documents and related research, it's amazing how and when the pieces fit together. I call "Shenanigans," however, perhaps Carroll Shelby said it best when he stated "it's better to let a sleeping dog lie."